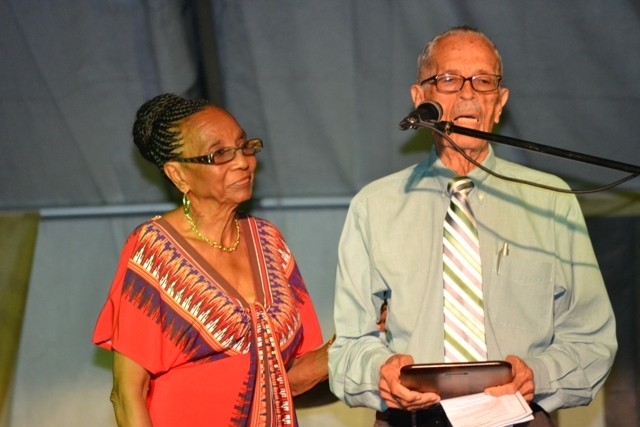 NIA CHARLESTOWN NEVIS (JULY 27, 2015) – Patrons for the Culturama 41 festivities are two surviving members of the Culturama Board of Trustees (The Board). They will preside over the two-week official calendar of activities which concludes on August 04. The theme for this year is “Culture fete and Fun; Culturama 41”. Arthur Evelyn and Violet O. Jeffers Nichols, where awarded with plaques by the Culturama Committee at the official opening ceremony of Culturama 2015. The event was held at the Charlestown Waterfront on July 23, 2015. The patrons are expected to lead the Street Parade slated for August 04, 2015. 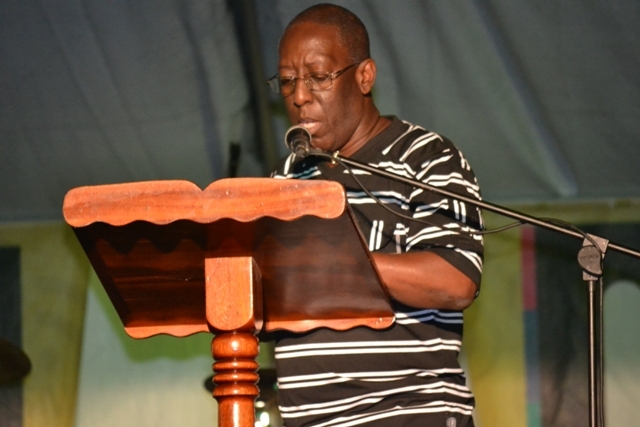 According to Executive Director of the Culturama Secretariat Abonaty Liburd, in its search for a 2015 patron, the Committee found it fitting gesture to honour the board and for its members sterling contributions towards the advancement and preservation of culture and Culturama on Nevis. In response to the award, Evelyn said he was deeply proud and happy to have been of some help to the Culturama Committee. “I have done as much as I could and now I am receiving a gift… I say a very big thank you to the Culturama Committee and wish the Committee continued support at all times and I say thanks again for this award to me,” he said. Nichols who was unable to be at the ceremony, told the Committee that she was delighted that what was started years ago had survived the test of time and she was very pleased to see how Culturama had evolved. The Board was formed in 1974 with Samuel Hunkins serving as Chairman, Arthur L. Evelyn as Treasurer, Cecil Byron as Legal Advisor and Almond Nisbett and Violet O. J. Nicholls as members. Ex officio member Irma Johnson served as Secretary to the Board. It was set up to establish a charitable fund which was called The Nevis Cultural and Social Centre Fund. This Fund was established at Barclays Bank. The objectives of the Fund were to acquire land either by free hold or lease hold in a suitable area of Nevis; to erect a cultural and social centre to be used for the promotion and fostering of cultural aims and activities on Nevis. It held its first meeting on the 28th of November 1974. In 1975, the first cheque to establish the Nevis Cultural and Social Centre Fund was handed over to Samuel Hunkins by Calvin Howell. After the construction of the Cultural Complex in 1983, the Board was dissolved.